It's impossible to tell where mankind will travel to in the future. Maybe to the far reaches of outer space, or the dark depths of the ocean, or jump to different dimensions. A foot solider will need to be highly trained and equipped to operate in any environment, against any foes they might encounter! Do you think a giant super-intelligent space spider is just going to sit by and wait because a trooper forgot their bug spray? Or, is a swarm of alien zombies going to stay away from water simply because the soldiers fighting them don't know how to swim? Not a chance! Your little trooper will be more than ready to take take the fight to the bad guys (or bugs) in this fierce looking costume! 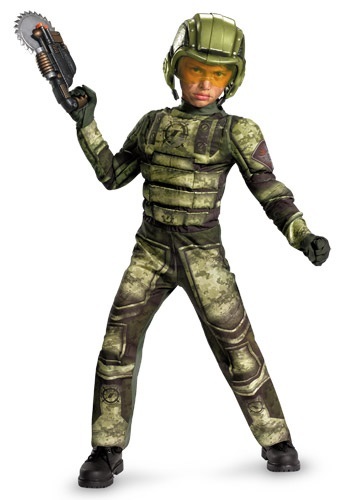 The jumpsuit is printed to look like camouflage body armor, and features built in foam padding to make your kid look as tough as a futuristic commando. It also comes with matching gloves and a plastic helmet to give them the tactical advantage. Suit up, solider, those monsters aren't going to fight themselves! the costume is very good but the helmet is not so strong.